It is one of the toughest environmental problems facing America. For over 20 years, scientists have documented the appearance of a summertime "Dead Zone" that all but obliterates marine life in what is arguably the nation's most important fishery, the Gulf of Mexico. Each year the Dead Zone grows to an area that is roughly the size of New Jersey - ranging from 5,000 to 8,000 square miles. The main culprit: an annual flood of wasted fertilizer from heavily farmed land, running off into rivers and finally into the Gulf, where it feeds the development of massive algae blooms. The algae then die and decompose, robbing the water of oxygen and suffocating all life that cannot leave the area. In the wake of last summer's hurricanes, many wonder how much more environmental abuse the Gulf and its invaluable fishery can withstand. But there is good news. A new Environmental Working Group (EWG) analysis of government and industry data shows that simple, targeted reforms of wasteful federal farm programs could make a significant dent in the Dead Zone while improving the bottom line for family farms throughout the Mississippi River Basin. We found that the vast majority of fertilizer pollution comes from a relatively small area of heavily subsidized cropland along the Mississippi and its tributaries where taxpayer funded commodity spending overwhelms water quality related conservation spending by more than 500 to 1. Shifting a modest portion of commodity subsidies, particularly the portion that goes to the largest and wealthiest growers, into programs that encourage more careful fertilizer use, wetland restoration and the planting of streamside buffers of grass and trees to absorb runoff, could reduce dead zone pollution significantly while also boosting the bottom line for family farms. The EWG analysis, an update of fertilizer run-off modeling that was conducted for the Mississippi River Basin (MRB) in the early 1990s, shows that at current prices, farmers flush more than one third of a billion dollars of nitrogen fertilizer down the Mississippi River each spring. This annual surge of nitrate fertilizer pollution is responsible for more than 70 percent of the total nitrate pollution entering the Gulf in the crucial spring months prior to the formation of the Dead Zone. In contrast, municipal sewage accounts for about 11 percent, animal waste about 12 percent, and atmospheric deposition about 6 percent. In the peak spring pollution period, 7.8 million pounds of fertilizer nitrate a day leaves the Mississippi River Basin, bound for the Gulf of Mexico. 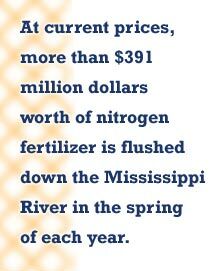 From 1998 through 2002, an average of $270 million dollars worth of nitrogen fertilizer was flushed down the Mississippi River in the spring of each year. At current fertilizer prices, the value of fertilizer lost down the Mississippi River each year is well over a third of a billion dollars - $391,000,000. Yet this problem is readily manageable. EWG research shows that nitrate pollution is disproportionately concentrated in a small portion of the MRB, and that crop subsidies, particularly corn payments, are concentrated in this region as well. At the same time, counties in this region have relatively less land enrolled in conservation programs than elsewhere in the MRB. This convergence suggests that a simple, common-sense reform of the way we spend tax dollars, to support targeted application of improved farming practices will produce significant and cost-effective long-term gains in water quality, and help restore the Gulf. Farms in counties that comprise just 15 percent of the total land area of the Mississippi River Basin are responsible for 80 percent of the critical spring surge of agricultural nitrate pollution to the Gulf. From 1995 through 2002, $28 billion out of $59.7 billion, or nearly half of all subsidies in the MRB went to these counties that comprise just 15 percent of the MRB. Farms in 124 counties that account for just five percent of the land area in the MRB account for 40 percent of spring nitrate fertilizer pollution in the Gulf. These top polluting counties in Illinois, eastern Iowa, western Indiana, northeastern Arkansas and southeastern Missouri, received $11.4 billion in subsidies from 1995 through 2002. Crop subsidy payments were about 500 times greater than conservation payments in the 124 counties that account for 40 percent of spring nitrate fertilizer pollution, with just $22.5 million in water quality payments compared to $11.4 billion in crop subsidies. At the county level, payment disparities of 1,000 to 1 are common, with some counties in the high polluting region getting 10,000 times more in crop subsidies than water quality conservation dollars. In counties with the highest fertilizer runoff, the proportion of land enrolled in conservation programs drops as the proportion of land in fertilized agriculture increases - just the opposite of what is needed to reduce nitrate pollution. Many farmers are concerned about fertilizer pollution and want to do something about it. In fact, in the top polluting regions of the MRB thousands of farmers have signed up for existing federal programs that support clean water, best management practices, and conservation, only to be turned away because money is being spent on traditional subsidy programs. In the top nitrate fertilizer polluting states of Illinois, Indiana and Iowa, $235 million in conservation and water quality grants for more than 11,000 farmers went unfunded under the Environmental Quality Incentive Program (EQIP) in 2004. This is more than four times the value of funded EQIP projects in those states in that year, some $52 million. Crop subsidies in those states, which in general encourage excessive nutrient use, totaled more than $2.7 billion in 2004. In the 14 states where the 15 percent of high polluting counties are located, EQIP requests from 55,100 farmers valued at more than $832 million were unfunded in the same year. Wetland restoration and preservation programs fared no better. In 2004, 2,450 farmers were unable to enroll 321,000 acres in the Wetlands Reserve Program (WRP) due to a $411 million shortfall in WRP funding. Focusing resources on reducing fertilizer runoff in these hotspots through wetland restoration, streamside easements and better nutrient management on working farm lands will improve local water quality, restore stream and river banks, help control floodwaters, and ultimately reduce the size of the Dead Zone in the Gulf of Mexico. Currently, however, trends are in the opposite direction. In the nitrate pollution hotspots identified in this analysis, less than 3 percent of the acreage is enrolled in any kind of conservation program. Overall, acres set aside for conservation in the MRB have declined over 30 percent since their peak in 1993. Taxpayers should not be forced to subsidize agricultural production that contributes to the Dead Zone in the Gulf of Mexico nor the pollution of the Mississippi River. At the same time, pollution control strategies must recognize that much of the highly polluting acreage is also some of the most highly productive land in the nation. Policy makers must be strategic about conservation decisions and blend a combination of nutrient management requirements with well-funded opportunities for easements and riparian and wetland reserves. 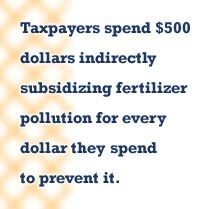 Taxpayers spend $500 dollars subsidizing fertilizer pollution through direct commodity payments for every dollar they spend to prevent it. As a result, less than three percent of the farmed land in the pollution hotspots identified in this analysis is enrolled in any federal conservation program, and this figure includes the Conservaton Reserve Lands. The main reason for this dismal participation rate is lack of funds, not lack of farmer interest. Funding for EQIP the WRP and related water quality improvement and protection programs must be increased dramatically to help growers protect critical buffer zones, wetlands, and riparian areas. There is also a glaring need to improve nitrogen management practices. Recent data from USDA shows that farmers who test their soil for nitrate apply about 4 percent less nitrogen per acre than those who don't, but that only about 17 percent of acres are currently tested. Farmers have no incentive to optimize fertilizer applications because nitrogen is a relatively minor input cost, even with rising energy prices, and because nearly all farmers in the MRB are cushioned in the marketplace by generous taxpayer subsidies. After a phase-in period to ensure that capacity is available, nutrient management plans must be required as a condition of receiving taxpayer subsidies in the 15 percent of counties in the MRB that account for 80 percent of spring fertilizer runoff surge to the Gulf. A combination of improved fertilizer management, easements, and restoring riparian buffers, wetlands and pasture on as little as 3 percent of the land area of the MRB would dramatically reduce N loading to the Mississippi River, its tributaries, and ultimately the Gulf of Mexico. By redirecting some of the money now spent on commodity payments to conservation payments, US farm policy can be brought into line with government objectives to protect fisheries and marine systems in the Gulf of Mexico. As shown with the conservation reserve program, diversified land use provides a variety of benefits, including flood control, reduced sediment loading in streams, reduced municipal water treatment costs, improved fish habitat, carbon sequestration, and miles of connected habitat corridors for wildlife. The Dead Zone in the Gulf is not unique — all over the world, freshwater and marine systems are experiencing unparalleled chemical and nutrient pollution that wipes out productive fisheries and leaves a legacy of decay for future generations. The Gulf region is staggering both economically and ecologically to recover from last season's hurricanes, and the added stress of a continually increasing Dead Zone will only delay the recovery, perhaps indefinitely. Leveraging the existing system of subsidies to redirect money that is already being spent toward proven conservation programs is a winning strategy for all concerned. Our objective was to build a spatial model of the relationship between nitrogen loading factors in the Mississippi River Basin and the nitrate inputs to the Gulf of Mexico. The nitrogen loading factors in the MRB include: fertilizer use, animal waste, human waste, and atmospheric nitrate deposition. We sought to characterize the extent to which each factor contributes nitrate to the Gulf, and also provide updated information on which geographic areas are the largest contributors. We then took the further step of relating patterns of land use and nitrogen loading to the system of agricultural subsidies that support "program crop" farming in the United States. We employed standard methods of watershed analysis to examine how nitrogen use as fertilizer, and production as waste, contribute to nitrogen pollution in rivers and streams. We calculated fertilizer use with USDA crop data, checking the accuracy of our fertilizer use estimates against a commercial database of fertilizer sales in the United States. We acquired nitrate flux data from water quality monitoring sites maintained by the US Geological Survey (USGS), summed the nitrogen inputs that occurred within the drainage areas of each site, and used a statistical regression model to describe how nitrogen inputs on the land are conveyed into rivers, and ultimately into the Gulf of Mexico. We used the resulting statistical relationship to identify which areas of the MRB are the greatest sources of nitrate to the Gulf of Mexico. Finally, we used USDA agricultural subsidy data to characterize relationships between subsidies, land use, and nitrate pollution. The regression model provided an effective description of spring nitrate flux dynamics in the MRB, accounting for about 84 percent of variation in the data. Our modeled results for the March-June runoff period of each year closely matched USGS results for measured nitrate flux to the Gulf of Mexico, and our conclusions mirrored those of other studies examining the sources of nutrient flux to the Gulf.